Wow – So much has happened since the last newsletter, it's hard to know where to start! BUT...Here goes! The home is very blessed to have found a new staff member who has settles in very quickly and treats the children as if they were her own. Gloria (or Meitie as she prefers to be called) has fitted in so well and has become a valuable member of our team here at Masigcine. The Board decided to reward our dedicated staff and every month acknowledge a "staff member of the month". The reward includes a certificate of appreciation and R250. We are pleased to say in September this was given to Gloria Spayer. In the month of October it was awarded to Magnolia and for November we have given it to our newest member of staff - Meitie. We hope this reward encourages all the staff to continue to work above and beyond how they already do. We have had a number of new children come to Masigcine with various circumstances. We have also had a couple of our children re-united with family members and who have returned home. I am happy to report that Canville, our only Afrikaans child, was re-united with his father and although we miss him very much he is doing well and we are so happy to see him with his family again. Another success was Amahle who had been at Masigcine since 2004. She had frequent visits from her Auntie and it was decided after they built up a good relationship that she would live with her Auntie in the Eastern Cape. We pray that both of these children thrive in this family environment. We have had a number of new volunteers at the home and we would like to thank them for taking the time to come here and for all the love they show to our children. It is not always just a job of coming to play with the children, but also sometimes involves getting "your hands dirty" and all of our volunteers are more than willing to do this. Thank you. 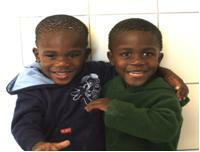 We have had a lot of help from Pascal who worked at the Durbanville children's home before coming to Masigcine. He is originally from Germany and has a lot of expertise in woodwork so we are very happy to report Masigcine has had a mini facelift and is looking a lot better thanks to Pascal. We would like to thank all the volunteers who came to help while the staff had a training day. It was such a wonderful day as we also celebrated a birthday for a 4 year old whose parents decided they wanted to share this special day with all of our children. Thank you to Colin and Navesh. Our children had a wonderful time with a bouncy castle, an entertainer and too much food to mention! One of our volunteers comes to the home to regularly take Qamane for therapy sessions at the Chere Botha School. Thanks to Bubby who has stuck by Qamane all this time, even through potty training! Her bed sheets have never been washed as much!! The recent report from the therapist was very positive and Qamane is progressing with speed. We have also been blessed with a volunteer Occupational Therapist. Liz has been coming to Masigcine for 5 weeks and has spent a lot of time doing activities with the children which they have really enjoyed. When the older boys come home from school it has been wonderful to see them outside painting with Liz and also baking for the first time! The biscuits were terrific! Liz has since got a full time job helping other children so we want to wish her lots of success. All of our children are growing by the day! I am proud to say ALL of them have now learnt there "ABC" and they love the opportunity to sing it! They are also learning some English and come out with the funniest phrases, such as last week when Masithandaze said "I am fine, I am batman and I can fly!!" Well, let's hope one day all these kids will fly out of this home and into a family of their own. Many thanks to all of you who have given to this home. Small things can go a long way and we appreciate all that you have given us. When we cannot use an item we will either give it to another Home in need or sell it in this community for a small fee so we can use that money to buy essentials for the home. NOTHING is wasted or thrown away. THANK YOU to each and every one of you - your donations are sincerely appreciated.